Jenner is a small coastal town and census-designated place (CDP) with a population of about 136 in Sonoma County, California, U.S. 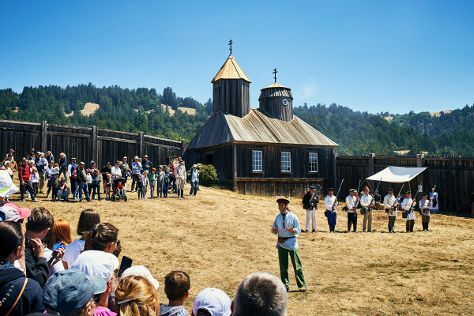 Kick off your visit on the 15th (Mon): kick back and relax at Bodega Head, then look for gifts at Patrick's of Bodega Bay Salt Water Taffy, and then explore and take pictures at Fort Ross State Historic Park. Here are some ideas for day two: tour the pleasant surroundings at Goat Rock Beach, then take in the architecture and atmosphere at St. Teresa of Avila Church, then kick back and relax at Bodega Dunes, and finally enjoy the sea views from Point Reyes Lighthouse. To see maps, where to stay, ratings, and more tourist information, read Jenner trip itinerary maker site . New York City to Jenner is an approximately 14-hour flight. You can also drive. You'll gain 3 hours traveling from New York City to Jenner due to the time zone difference. Plan for a bit cooler nights when traveling from New York City in July since evenings lows in Jenner dip to 53°F. Wrap up your sightseeing on the 16th (Tue) to allow time to travel to Fort Bragg. Fort Bragg is a coastal city along State Route 1 in Mendocino County, California. Get outdoors at Glass Beach and Point Cabrillo Light Station. You'll visit kid-friendly attractions like B Bryan Preserve and Noyo Headlands Park. Step out of Fort Bragg to go to Point Arena and see Point Arena Lighthouse & Museum, which is approximately 1h 20 min away. The adventure continues: tour the pleasant surroundings at Mendocino Coast, look for gifts at Mendocino Jams & Preserves, admire the natural beauty at Mendocino Coast Botanical Gardens, and immerse yourself in nature at MacKerricher State Park. To see reviews, other places to visit, and tourist information, use the Fort Bragg online travel route planner . You can drive from Jenner to Fort Bragg in 2.5 hours. Traveling from Jenner in July, you will find days in Fort Bragg are somewhat warmer (95°F), and nights are about the same (57°F). Wrap up your sightseeing on the 19th (Fri) to allow time to drive to Crescent City. Crescent City is the county seat and only incorporated city in Del Norte County, California. Get in touch with nature at Trees of Mystery and Enderts Beach. Museum-lovers will get to explore Battery Point Lighthouse and End of the Trail Museum. Take a break from Crescent City with a short trip to Redwood National Park in Redwood National Park, about 1h 10 min away. There's more to do: immerse yourself in nature at Jedediah Smith Redwood State Park Campground and look for all kinds of wild species at Stout Grove. To find ratings, other places to visit, where to stay, and tourist information, you can read our Crescent City online driving holiday planner . You can drive from Fort Bragg to Crescent City in 5 hours. Alternatively, you can do a combination of car and bus. Traveling from Fort Bragg in July, you will find days in Crescent City are much colder (62°F), and nights are little chillier (52°F). Finish up your sightseeing early on the 22nd (Mon) so you can go by car to Florence. Florence is a coastal city in Lane County, in the U.S. Kids will appreciate attractions like Yaquina Head Outstanding Natural Area and Devils Punchbowl State Natural Area. Your inner history buff will appreciate Heceta Head Lighthouse and Yaquina Head Lighthouse. Venture out of the city with trips to Yachats (Cape Perpetua Visitor Center - Siuslaw National Forest & Yachats State Park), Newport (Hatfield Marine Science Center & Oregon Coast Aquarium) and Bandon (Coquille River Lighthouse & Face Rock State Scenic Viewpoint). Next up on the itinerary: putt your heart out at Sandland Adventures, get in on the excitement at Sand Master Park, explore the fascinating underground world of Sea Lion Caves, and explore the striking landscape at Thor's Well. To see where to stay, photos, ratings, and tourist information, read our Florence online vacation planner . You can drive from Crescent City to Florence in 5 hours. Another option is to take a bus. In July, daytime highs in Florence are 67°F, while nighttime lows are 54°F. Finish your sightseeing early on the 27th (Sat) so you can travel back home.